Pyramid… It’s one of the world’s grandest examples of human ingenuity and architecture, a marvel of technology defying modern comprehension. For reasons not 100 percent known to him, nearly three decades ago, this beguiling and ancient three-sided feat of brick and mortar seeped into the head of Vern Shank, a pillar in his own right of the Palm Coast music and entrepreneurial scene. So in 1988, Vern and his partner Art kicked off their own brand and company Pyramid DJs,a musical enterprise that is best understood and made unique by the face/faces behind it. Vern–an enigmatic local force himself–if born in another time and place, with his grandiose ambitions, might’ve been seen clothed in resplendent pharaoh garb. While none of us knew a young King Tut, Vern is most likely a humbler sort and we do have the privilege of knowing him. Rather than a bejeweled headdress, Vern is content with his trademark felt “Scooby Doo” cap that you can see adorning his head as pictured in this post. For Vern, his farthest starting corner on the pyramid was Pennsylvania. That’s where he grew up and that’s where he stumbled into his first music job at 19. That other guy in the equation, Art Bourasseau, is Vern’s best friend of 27 years. Art makes his living and helps guide the company from Burbank, CA. He and Vern met at the former record store, “The Wall Music” (which has since become FYE or For Your Entertainment), the first sandstone building block to their empire. Vern and Art were both assistant store managers, a story we’ll revisit. “We just clicked musically and as bros,” Vern says. That was enough. It’s a case of “Ying and Yang,” one steps into the other’s domain as needed. Vern is more of that impetuous force of nature, the “fast and furious” one, most valuable for tasks in which there’s no time to lose. Art, more collected, methodical, takes the lead in situations which call for taking things that call for a more measured pace. As the universe would direct their movements, the two chose to cleave the company into two branches: Pyramid DJs and a separate music label they tabbed MuSick Recordings, which has been around for 20 years now. Art’s responsibility. Vern stuck to DJing as that was his titular skill on the pyramid. Vern didn’t know he wanted to DJ; that was just an afterthought that snowballed one day without cease. Vern had wanted to be a musician. And he was. But one day, years back, between sets with his LA-based band of the time, an innocent event would set the tone for his next three decades. “Yes,” is the Story of Vern’s life…Of course. If you can DJ well, you will quickly find yourself in high demand. One event can quickly turn into two, three, or four–rapid fire. Suddenly, Vern was doing three events each day, consistently. “I just kept saying, ‘Yes’ to everything.” Brick by brick. Art was doing the same from his side. Things moved so fast. Vern’s musical ambitions would have to wait. Once, an employee, “a really great worker”–“Dan,” we’ll call him–had just finished unloading and shelving a whole tractor-trailer of CD’s, videos, records and tapes by himself in record-breaking time. After he had finished, hours from when he started, sweat-soaked and out of breath, he took a seat. Just for a moment. “Dan” was unlucky that day. Seconds after he plopping down, Joe happened in. He didn’t say anything at first but he pulled Vern into the back office and commanded him to fire Dan for sitting on the job. “I tried to explain the situation–that I told him to sit down and rest for a moment after all that he just did,” Vern says. Vern obeyed but before he was done that night he’d thrown his clipboard at him. He took his write-up demerit. That day, Vern vowed to give everyone, especially his employees, the benefit of the doubt and that has never wavered. Too often, however, he forgets about himself. There’s a personal toll in building a near-three-decade empire like he has. “I put a lot of things off. A lot of other endeavors that I wanted to do,” he says. Avoiding burnout was a constant challenge. Health and living considerations weren’t always allotted for. “On the Go, on the Go, on the Go.” It’s a Vicious Cycle. But if he didn’t love it, he couldn’t do it. Yet to this day he struggles for respect. At a recent Entrepreneur Night, a gathering of attendees was asked: How many of you have been in business for two-four-six years? Vern’s heard that question a lot. For those who don’t know Little Steven, that’s Steven Van Zandt, the famed guitarist from Bruce Springsteen’s East Street Band. The song navigated its way through a nexus of connections among an underground Internet following right into Steven’s hands. “So, completely out of the blue, I get an email that I’m supposed to call this number,” he says. The rest is history, as they say. The Cherry Drops beat out legends like Paul McCartney, Tom Petty and the Heartbreakers, Chrissie Hynde and the Pretenders, and The Strokes for that distinction. The song, which appeared on the Cherry Drops’ debut album “Everything is Groovy,” was given the honorific distinction in August, 2014 for one week! Additionally, The Cherry Drops also won the award for the third biggest song of the year and Drew Carey chose it as one of his ten favorite songs of all time. Vern never pushed for any of this. “All this happened in the background,” of other things he was doing, he says. 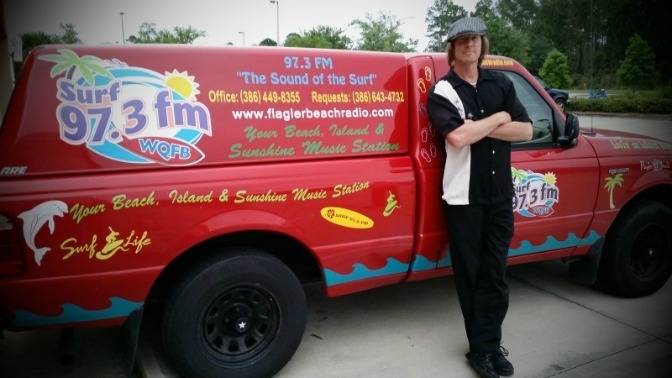 Vern also manages Surf 97.3. His self-described “Sunshine, Happy Vibe music” station, the music of which permeates “that spot in your mind where everything is all right for a while,” a garden Vern perennially strives to bask in, always keeping a premium on keeping his head on straight. In addition to Pyramid, the Cherry Drops, and Surf, Vern is also a screenwriter who spends his summers with Art in Burbank. Only there does Vern have time to write. “We all have our inner demons and maybe it’s our inner demons that drive us,” he says. 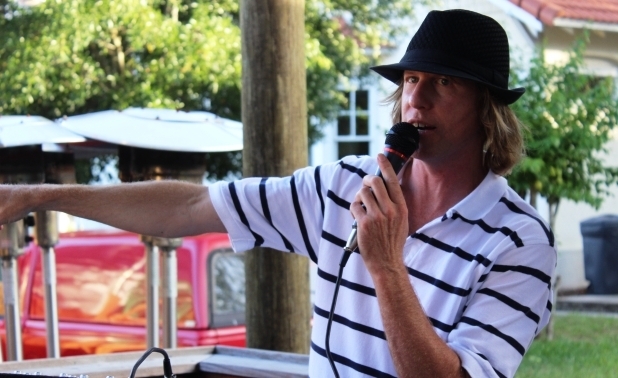 Just look at a guy who reached the pinnacle like Owen Wilson, the famed and seemingly always cheerful comic who, for a time, had become suicidal. Wilson is one of Vern’s idols. It just takes one negative person to bring everything down quicker than a tower of Jenga blocks, Vern says, and he’s known many of them in his life. Some go back even further than that distasteful Mr. ‘Joe.’ Much further. Not to get too personal, but some were very close to him — they’ve earned mentions in his songs. Yet even they have contributed positively in their own way. “Maybe through the feeling that I’m nobody, it’s why I’m trying to do all these things…To try and succeed so much.” That monomaniacal grind to fight the feeling that he’s more than a “little grain of sand” on the beach. Vern might say that “Determination, Drive, and a little bit of Insanity” make up the three points of his own, personal pyramid as well as the business one that he and Art continue to ascend, though that mysterious pinnacle, whatever it is, may be nothing more than a mirage. “I can never see it,” he says. Vern was an early sponsor of The Entrepreneur Night Movement. He and Pyramid DJs make it possible for great music and announcements, month after month. He never knows what kind of venue he’s going to get, except that it’ll be hosted by a small business, keeping with the entrepreneurial spirit of the event. Ky Ekinci, one of the organizers of Entrepreneur Night says this about Vern. 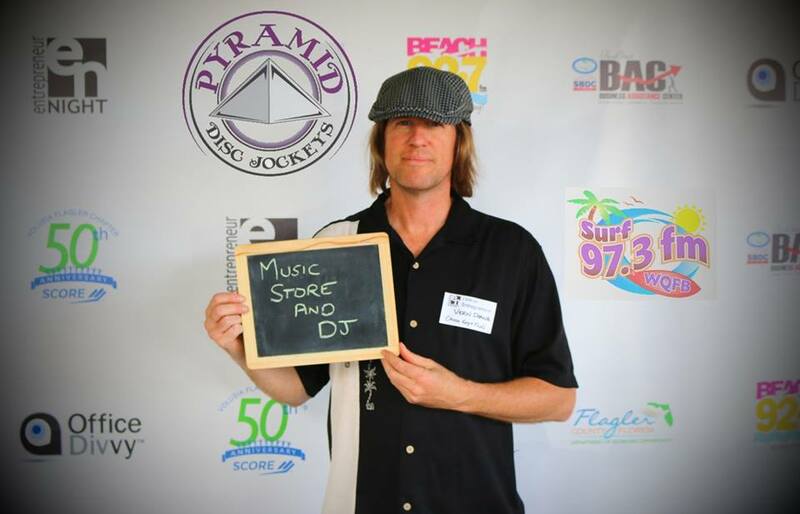 Come meet Vern or and the Pyramid DJs team at one of the upcoming Entrepreneur Night events.